Appropriate design and precise control are the two critical factors that ensure water-based low temperature hot water (LTHW) central heating and chilled water cooling (CHW) systems run effectively and efficiently. But these factors are not enough on their own to ensure good performance, especially in commercial buildings. System efficiency also requires suitable commissioning by an engineer responsible for determining the right comfort levels and effective temperature control all year round. Commercial installations – particularly applications such as offices, apartment blocks, retail and hotels – face considerable stresses that can significantly impact the operation of their LTHW and CHW pipe networks. These can be caused by a range of factors including the use of electronics, unpredictable issues such as open windows and doors, and the fact that their heating and cooling systems must accommodate the high volume and varied movement of people. Poor temperature regulation can negatively affect the performance of building occupants, but effective balance and control by the building service engineer can mitigate this. With differential pressure control valves, the DPCV regulator typically applies the pressure of the controlled flow medium (water) against a diaphragm. This opposes a compressed spring to achieve force balance with the diaphragm at a given set pressure. Any change in controlled pressure causes the diaphragm to move, which changes the flow area of the regulator, thus adjusting the controlled opening of the valve. 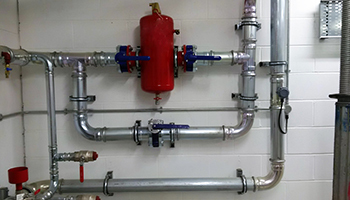 Flow balance is often achieved by means of double regulating valves (DRV) installed in the opposite supply pipe from the terminal units which can be used to regulate flow and isolate the system. Pressure independent control valves respond to pressure changes to maintain the desired flow by integrating dynamic balancing and control functions. PICVs combine several valve functions to enable very cost-effective optimised control, while also simplifying the commissioning process. PICV normally contain the 3 functions of DPCV, DRV & MCV (Motorised Control Valve) within the 1 valve. Thermal balance valves regulate flow depending on water temperature through the thermostatic control of circulating hot water systems. • Dynamic balancing can respond to changes in system pressure by automatically adjusting the flow coefficient and can simplify commissioning of wet systems. • Since individual zones can be set up and no rebalancing is required, plant can be commissioned step-by-step, making it easier to add to or remodel the system. • ‘Hunting’ can happen when the valve’s on/off cycles are close together and the system cycles too quickly. It creates undue wear and tear which can shorten the life of the valve, particularly the control actuators. However, dynamic balancing ensures there is no risk of ‘hunting’ because the valve absorbs pressure changes at source so the control loop remains stable. • Dynamic balancing valves offer greater comfort and commissioning ease with no routine maintenance requirement or additional components necessary to those utilized within traditional systems. So, what does optimal temperature regulation look like? In my view, it is achieved when there is 100% temperature control throughout the day for the whole year round. When control temperature swings become too great, this typically indicates overheating or under cooling and, thus, energy wastage. But beware. You will only get a well-balanced variable volume system if you employ right set of hydronic balancing valves (also known as commissioning valves). You need to achieve the right circulation flow rate throughout the whole system, whether or not there are any central or localised pressure changes. Of course, during partial system loads, differential pressure changes inevitably occur during a significant proportion of any UK building’s operational life because of our mild climate. And lower operational building loads are a great opportunity for renewables, lower carbon energy or lower grade energy sources. This boosts energy savings, but only when these alternative energy sources are integrated effectively with both good building design and commissioning. Poor hydronic balancing of a LTHW or CHW water-based system will result in unequal flow distribution which, in turn, will cause surpluses in some terminals and undersupply in others. This has a big negative impact on comfort control quality and the desired heating or cooling will not be forthcoming in every part of the installation. One way to avoid this is to install the right mix of hydronic balancing valves including differential pressure control valves (DPCVs), pressure independent control valves (PICVs) and thermal balance valves (TBVs). These are remarkably efficient at helping to stabilise comfort and temperature control while also contributing to flexibility and simplifying the commissioning procedure (see the box). A DPCV maintains a steady differential pressure under dynamic balancing conditions, ensuring flow can’t exceed the desired rate. In this way, it reduces energy consumption and the risk of noisy vibrating pipes while also allowing the commissioning engineer to focus on one circuit at a time. For optimal energy efficiency and tight comfort control, differential pressure valves should be used as close to the output terminals as possible. However, pragmatism and cost-effectiveness dictates these may be installed within network branches and sub-branches then using balancing valves and control valves downstream to maintain delivery. The DPCV is often called a ‘dynamic balancing valve’ because it is constantly adjusting to the system and maintaining its set-point position, so it is ‘moving’ in response to its own feedback. PICVs are also self-regulating – in other words, they maintain control in the same way as DPCVs, dynamically to the system. However, they also have a control actuator fitted that allows the Building Management System control to adjust the PICV output to changing building load requirements. Having a control actuator operation is not unique to the PICV; all control valves have this feature. However, a PICV uniquely combines hydronic balance and control into 1 valve at the output terminals. Thus saving cost, space and commissioning time on the install whilst ensuring improved delivery performance, energy efficiency and comfort over the lifetime of the building.